Green wood craft is a traditional skill going back over many centuries. The designs and names associated with these crafts vary from region to region, but traditional shave horses, draw knives and pole lathes are the common tools used in this craft. 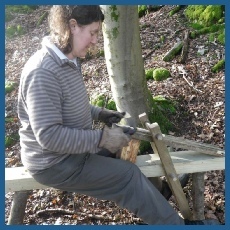 We offer courses in making your own shave horse or pole lathe using traditional designs. We can also show you how to bend wood so that you can create attractive designs that you will want to show off to your friends. We generally try to use green wood for as much of the build as possible. This shave horse is based on the traditional English design and is a great tool for shaving down wood to more useful sizes or shapes. Woods such as Yew or Cedar may be used to make small things like picture frames. A well chosen piece of wood can make a very attractive picture frame which is relatively simple to make and a good starter project.